Researchers from MIT have developed a new target-finding mechanism that allows microscopic devices to autonomously find their way to areas of a cell surface. Nature has developed a wide variety of methods for guiding particular cells, enzymes, and molecules to specific structures inside the body: White blood cells can find their way to the site of an infection, while scar-forming cells migrate to the site of a wound. But finding ways of guiding artificial materials within the body has proven more difficult. Now a team of researchers at MIT led by Alfredo Alexander-Katz, the Walter Henry Gale Associate Professor of Materials Science and Engineering, has demonstrated a new target-finding mechanism. The new system allows microscopic devices to autonomously find their way to areas of a cell surface, for example, just by detecting an increase in surface friction in places where more cell receptors are concentrated. The finding is described this week in a paper in the journal Physical Review Letters, written by Alexander-Katz, graduate student Joshua Steimel, and postdoc Juan Aragones. Cells have a way of locating areas that bear a specific kind of chemical signature — a process called chemotaxis. That’s the method used by white blood cells, for example, to locate regions where pathogens are attacking body cells. “Our system is very simple,” Alexander-Katz says — similar to the way in which bacteria locate nutrients they need. The system, without guidance, samples areas on a surface and migrates toward those where friction is greater — which also correspond to areas where receptors are concentrated. 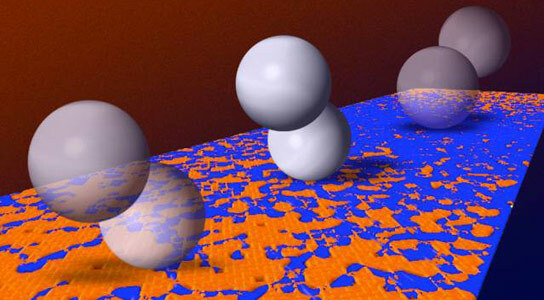 The system uses a pair of linked particles with magnetic properties. In the presence of a magnetic field, the paired particles begin to tumble across a surface, with first one particle and then the other making contact — in effect, “walking” across the surface. Such magnetic microwalkers, he adds, could be unleashed to locate areas of interest on various kinds of surfaces, based solely on differences in friction. The particles naturally migrate toward high-friction regions, where they could then be induced to interact with a surface by active molecules attached to them. “It’s a very versatile system,” Alexander-Katz says, that can be functionalized by attaching other kinds of receptors or binding agents to affect or monitor the target area in different ways. The next step is to test the approach in more complex settings. The initial work was done with flat surfaces; the team now aims to conduct studies in complex 3-D settings to make sure the process works effectively in situations that more closely resemble a real cellular environment. The research was supported by the U.S. Department of Energy, the MIT Energy Initiative, and the Chang family. Be the first to comment on "New Target Finding Mechanism Allows Microscopic Devices to Autonomously Find Their Way"